Resource Description: Central to the vision of JKN and the Government of Indonesia’s commitment to enhancing the health of all of its citizens is strengthening the role of primary care to prevent, treat and manage health conditions. How it is working, what the challenges are, and where might changes to regulations or operationalization of JKN contribute to strengthening the system so that JKN can achieve its goals. 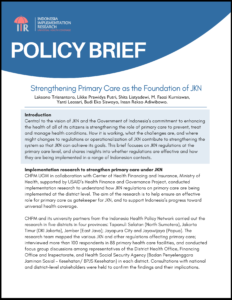 This brief focuses on JKN regulations at the primary care level, and shares insights into whether regulations are effective and how they are being implemented in a range of Indonesian contexts.